At 12 noon on May Day I walked through central Athens, where the usual enormous gathering of workers was taking place, for this anniversary is always celebrated in appropriate style all over Greece. Traffic was banned, people choked Syntagma Square and surrounds, and police were everywhere. It took me over ten minutes to make my polite way to the Grande Bretagne Hotel corner, a distance of about 200 m.
I become uneasy in large crowds, and this one was huge; I have been holding my breath over the Greek situation for weeks in any case. But I was lucky: the atmosphere was calm, and my luck held throughout the afternoon. But by evening May Day had taken on the nature of the classic distress call: a violent mob had threatened the historic hotel, and the riot squad had been called out. The one MP who had ventured into the square had had to be rescued by the police and removed to a place of (comparative) safety. How are the Greek people feeling? I have been asked. My answer is that there is no simple answer, for they do not all agree: after all, where there are two Greeks, there are always three opinions, if not more. But broadly speaking, most people are angry, particularly the young. Greece has never treated its youth well. One Greek woman remarked to me not long ago, 'Greece eats its children' — she was thinking of taking her only child to be educated in France. Most Greek youths studies hard, both here and overseas, yet disappointment is often the result: youth unemployment is running close to 30 per cent. And Greece is not a meritocracy: corruption and nepotism rule, so that a young person can do well if he/she has the 'right connections'. To disappointment and resentment, add the fact that young Greeks, like most of the population, are highly politicised, and the result is a volatile mixture. To young people, five years is an eternity, and this is the minimum period of austerity currently forecast. As well, the men are forced to give up at least another year to national service. Some of the young resent their parents' past actions, blame them for the current mess, and cannot see why they should have to suffer as a result. I suppose it is human nature to try to find a scapegoat. Those same parents tend to blame politicians, and it is true to say that transparency has never been a feature of Greek politics. Neither has accountability. The average Spiros Papadopoulos, it is safe to say, knew nothing of the previous government's wheelings and dealings with international octopus Goldman Sachs, for example, which enabled the true state of the deficit to be masked in what has been called blatant balance-sheet cosmetics. But many of the older generation have a great sense of entitlement, and can see no fault with a system that permits the existence of an unwieldy and inefficient public service and a working life that permits many people to retire at 45 on comfortable pensions. They resent the threat to what they see as their hard-earned retirement. For most of Greek society, the crystal ball refuses to cooperate: there is no clear vision of the future, a future, at all. But this week, on the day of the general strike, with the Parthenon barely visible through layers of smoke and tear gas, the main emotion among ordinary people was one of shock. Riot police had foiled one mob's threat to the Parliament building and the Presidential Guard, but another mob threw Molotov cocktails into a nearby bank and set it ablaze: three innocent people died. 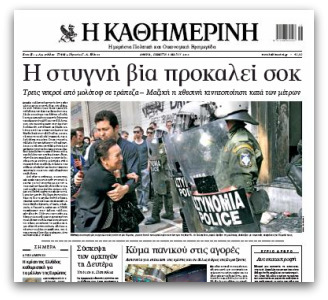 In sombre addresses to Parliament, both Prime Minister Papandreou and Opposition Leader Samaras deplored the outbreak of violence. Many people fear that much worse is still to come. I certainly do. And those same people fear that it will be ordinary individuals who will pay the price, as the workers in the bank building did. The great and the not-so-good may not be sleeping easily these nights, but they are still alive and their fortunes are intact. So far. What we hear over the news here in Australia sounds ominous for Greece, as possibly do the ramification effects in Europe. However it is very good to receive your personal insight from Greece Gillian. Your articles are always interesting and quite thought provoking. Greek youth has a right to feel cheated. If anything this Greek tragedy starkly illustrates that the assumption that the public purse is bottomless is nonsense. Billions have been poured into programs that allowed public-service workers to retire younger than anywhere. Those pension dollars, funded by borrowing, have created no new jobs, public works or universities. However greed is no respecter of national boundaries. In the United States, for example, homeowners borrowed against the over-inflated value of their homes to take overseas vacations or buy luxurious trinkets such as boats and bathroom renovations. Such is the nonsense that you can have it all without consequence. One by one the dominoes are falling, and all governments - including Australia, regardless of whether it is Rudd or Abbott - are bound to cut back even further on spending. It will not only affect the disadvantaged directly but also starve companies that have grown dependent on government handouts to expand and hire, further hampering economic growth, exacerbating unemployment and putting a lid on consumer spending for years. I do share your fears, I have been worried about Greece & Europe for the past 9 months. I also believe it will come worse. Many people in Greece as well as in Austria and Germany are fed up by corruption and the "great ones" always getting the profit, while we have to pay - in which currancy or in which way ever. Sadly, what's happening in Greece will be replicated across Europe in differing decrees of intensity. In the UK elections all political parties refused to debate the level of cuts needed in public spending to claw back the deficit. There will be a great deal of resentment when the depth of those cuts become obvious. The backlash will depend on how equitable people believe the cuts to be. I suspect they will not be fair. They never are! And so the unrest we are now seeing in Greece will spread to other European countries, including the stoic Brits.